Dive Asia and its PADI Course Directors welcome you to Phuket, Thailand, home to some of the best scuba diving of Asia. Phuket is also home to one of South East Asia's most popular and innovative IDC & CDC programs: Dive Asia's award-winning Instructor Training with Phuket's first and only PADI 5 Star Career Development Center. Choosing the right Course Director and PADI 5-Star Career Development Center for your instructor training is the most important decision you will make prior to entering the dive industry as a professional educator. Dive Asia and its four PADI Course Directors provide the quality and expertise you should expect and demand during your future career training. Look at what will make you successful in the real world - you deserve the best training and education available. Dive Asia CDC is Phuket's premier PADI IDC Center and has been running the most comprehensive and successful instructor training program in this area for years. There are many types of dive facilities available to you as a student. Most local centers can provide a competent introductory scuba instruction course, but when you're looking for more than entry-level, you need the highest quality facility available, PADI's 5-Star Career Development Center. In April 2001 and again in April 2002 Dive Asia became the first PADI Dive Center worldwide to be honored twice with PADI's Hallmark of Excellence Award for Outstanding Contribution to Instructor Development. The award is a result of Dive Asia its PADI Course Directors consistently offering South East Asia with the most successful instructor-training program in terms of both popularity and IE pass rates. One of the most important steps towards a successful career in diving is your instructor training. Becoming a diving instructor is not only a change of career; it's much more. You are embarking on an adventure and a change of lifestyle! It is important that you receive the proper preparation to make this change a success! Dive Asia's extensive instructor-training experience and prestigious PADI 5 Star CDC rating is your guarantee for quality, service and results. Phuket is without doubt one of the best learning environments you can find. 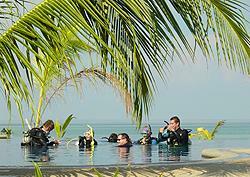 Phuket offers excellent diving conditions, attracting thousands of divers every year. An international and exciting atmosphere, with a touch of oriental adventure, warm friendly waters (close to 30 degrees Celsius), a tropical climate, beautiful beaches, and the smiling Thai hospitality, all adding up to a pleasant and enjoyable stay on Phuket. To ensure that you can concentrate fully on your IDC, Dive Asia and its Course Directors provide dedicated Instructor Training in English with German, Dutch and French language support as well. Step aboard Dive Asia's award-winning Instructor Training and start your new career now!